Sigma3 have worked closely with Angela to create an exciting space in which to run courses and events. The Cookery School Kitchen benefits greatly from top-of-the-range Neff appliances that include induction and gas hobs; Circotherm and Aqua-assist ovens. It literally is a food lover’s playground for up to 8 people on a One Day Course or Skill Builders and up to 20 on a Corporate or bespoke cooking event. 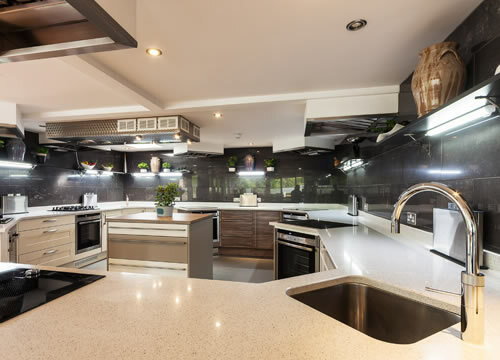 Each of the fully equipped workstations provide state of the art equipment including Flint & Flame knives, Meyer cookware and a wide range of Bosch appliances. Our Saturday Morning Kitchens can welcome up to 50 people theatre style and Lunch Clubs up to 34 people for a special Demonstration and Dine experience. The dining area is relaxed and informal, with a flat screen TV and a camera, which is used for our ‘live’ events so that audiences are able to pick up all the important details during a demonstration.